Excellent Condition Working & earning on location. Bill acceptor & coin acceptor. Dispenses a fortune card & speaks funny sayings. Lighted glass ball, jewelry, genie lamp, wooden flute, and various trinkets. Holds 2000 cards with 32 different fortunes. Measures: 77h x 24w x 24d. 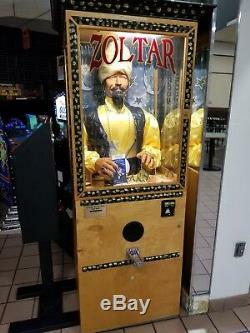 The item "Rare Zoltar Speaks Fortune Teller Original Authentic Coin Op Machine" is in sale since Saturday, February 2, 2019. This item is in the category "Collectibles\Arcade, Jukeboxes & Pinball\Arcade Gaming\Video Arcade Machines". The seller is "ebuyauto" and is located in Swansea, Massachusetts. This item can't be shipped, the buyer must pick up the item.